Team dCode likes feedback and relevant comments; to get an answer give an email (not published). It is thanks to you that dCode has the best Snellen Chart tool. Thank you. > [News]: Discover the next version of dCode Snellen Chart! The chart is intended to be used at a distance of 20 feet (about 6 meters) but can be closer if reading difficulties are presented. The person tested must open one eye at a time. The examiner/the optician randomly select letters on each row and notes the right and wrong answers. The score per eye is the result of the distance divided by the value of the smallest line read correctly. The result of the score enable to make a decision on whether or not to wear a visual correction device (glasses). 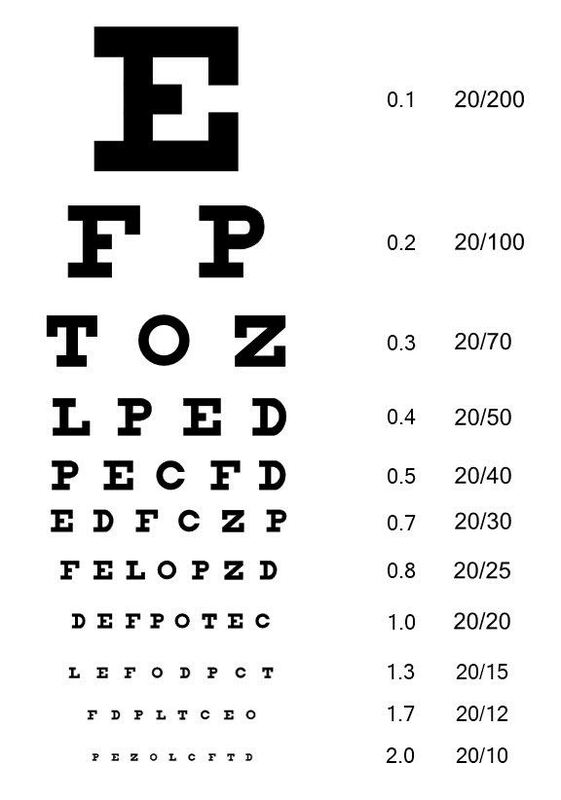 How the Snellen Chart was created? The Snellen scale uses different letters depending on the country, the principle is that they are quite easily discernible. But can be different and suitable for any type of audience. The size of the letters decreases on each row which makes it possible to evaluate with a fraction or a decimal number the most value read by a person tested. When the Monoyer Chart was created? Snellen created it in 1862. Improve the Snellen Chart page!